Lane keep assist system and adaptive cruise control are active safety systems, which provide driver assistance and avoid vehicle collisions. This combination of the active safety systems are a part of the advanced driver assistance system (ADAS), which is considered as a backbone for autonomous vehicles. Lane keep assist system and adaptive cruise control for automotive are designed to assist the driver by detecting lane markings on the road and distance of the vehicle in front. The combination of the systems in the vehicle reduces the possibility of accidental collision. The lane keep assist system detects the marking of the lane and assists the driver to keep the vehicle within the lane, either by providing a warning or by automatically steering the vehicle when it advances outside the desired lane. The adaptive cruise control system maintains safe distance between vehicles and avoids front to front side collisions. Lane keep assist and adaptive cruise control systems for automotive reduce the stress on the driver of the vehicle by providing information about the driving conditions of the vehicle. According to data gathered by the NHTSA's, 37% of all transportation fatalities in the U.S. are caused by vehicle running off from the road. These road accidents occur due to driver error, which can avoided with the incorporation of the lane keep assist system. Rising number of accidents, owing to increase in traffic flow, can be minimized by means of adaptive cruise control, which detects the slower moving vehicle in front and decelerates the speed of the vehicle, thereby avoiding front collision. The safety and comfort provided by the combination of these systems while driving is a key factor driving the lane keep assist and adaptive cruise control market for automotive. Since the combined system ensures stress-free driving and safety of the passengers, long route driving less strenuous, as the driver doesn’t have to maintain the speed by continuously pressing the pedal and brakes. This is a key factor that is expected to drive the lane keep assist and adaptive cruise control market for automotive during the forecast period. Awareness about advanced driver assistance systems equipped in vehicles has been increasing in recent years due to safety and security concerns, which in turn is also expected to boost the global lane keep assist system and adaptive cruise control market for automotive during the forecast period. However, the combined safety system is not efficient in regions or areas that experience adverse weather conditions such as fog, rain, and snow. The high cost of the combined system also affects its demand in the medium vehicles segment. The entire system is operated by electronic components and malfunction of the components leads to false interpretation, thereby making the system unproductive. These minor drawbacks are likely to restrain the lane keep assist system and adaptive cruise control market for automotive to some extent during the forecast period. The electronic control unit (ECU) component segment is responsible for the actions performed by the lane keep assist system and adaptive cruise control, and hence, is expected to offer lucrative opportunities, thereby boosting the global lane keep assist system and adaptive cruise control market during the forecast period. ECU reduces the complication of the system by receiving the data from sensors and converting it into readable format. Hence, the segment is expected to witness significant growth by 2025. The aftermarket sales channel segment holds a prominent share of the lane keep assist system and adaptive cruise control market as compared to the other segments, owing to the higher rate of adoption of these technologies and shorter lifespan of electronic components such as sensors and wirings. The aftermarket segment is also likely to witness healthy growth during the forecast period due to rising safety concerns, especially in passenger vehicle. Malfunction of the components is a major factor that drives the aftermarket segment. The passenger vehicles segment held a key share of the market in 2016. This high market share held by the passenger vehicles segment is primarily ascribed to the increasing demand for ADAS in passenger vehicles, globally. In hilly areas, distraction of the driver or anxiety in drive handling is likely to pose a threat to human life and is likely to result in major damage to both passengers and vehicle. Such incidents are avoided by the lane keep assist system and adaptive cruise control, as they guide the car, thereby avoiding collision or accidents. The lane keep assist system and adaptive cruise control market for automotive has been classified into five prominent regions. Among them, Europe dominated with global market, accounting for 42% share in 2016. This is due to rising awareness about safety and increased number of accidents leading to the high rate of adoption of the combined safety system in the region. This trend is expected to continue during the forecast period. Automotive industries in this region are focusing on safety applications, by providing vehicle-based intelligent safety systems such as lane keep assist system and adaptive cruise control, which are expected to improve road safety in terms of crash avoidance, crash harshness protection, and post-crash phases. The global lane keep assist system market witnesses the presence of top manufacturers. Prominent players operating in the global market include Robert Bosch GmbH, Valeo, Continental AG, Denso Corporation, Delphi Automotive PLC., and ZF Friedrichshafen AG. Among these, Robert Bosch GmbH and Denso Corporation are major suppliers of lane keep assist system and adaptive cruise control. Since every manufacturer competes for offering unique safety features owing to the intense competition among automobile manufacturers have prompted them to continuously upgrade their products in order to cater to the considerable demand for innovative safety features that can be used for various applications such as crash collisions. Research and development in the field of driver assistance system and forming strategic alliances with car manufacturers have boosted the sales of Robert Bosch GmbH for lane keep assist system and adaptive cruise control market. Robert Bosch GmbH is a multibillion-dollar company, which invests around US$ 8 Bn in research and development. This makes them innovative and results in distributing advance product thereby providing them with higher market share. This report analyzes and forecasts the market for lane keep assist system and adaptive cruise control at the global and regional level. The market has been forecast, based on revenue (US$ Mn) and volume (million units), from 2017 to 2025. The study includes drivers and restraints of the global lane keep assist system and adaptive cruise control market for automotive. It also covers the impact of these drivers and restraints on the demand for lane keep assist system and adaptive cruise control during the forecast period. The report also highlights opportunities in the lane keep assist system and adaptive cruise control market for automotive at the global and regional level. The study provides a decisive view of the global lane keep assist system and adaptive cruise control market for automotive, by segmenting it in terms of components, sales channel, vehicle type, and region. These segments have been analyzed based on present and future trends. Regional segmentation includes the current and forecast demand for lane keep assist system and adaptive cruise control in North America, Europe, Asia Pacific, Latin America, and Middle East & Africa. The report also covers the demand for individual application segments in all regions. 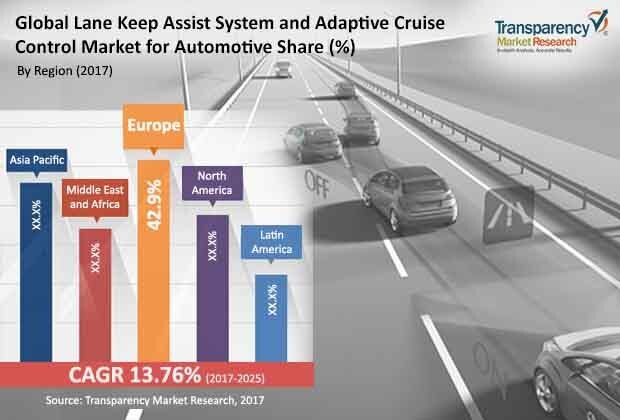 The study includes the profiles of major companies operating in the global lane keep assist system and adaptive cruise control market for automotive. Key players operating in the global lane keep assist system and adaptive cruise control market for automotive include Robert Bosch GmbH, Denso Corporation, Valeo, Delphi Automotive PLC., Continental AG, ZF Friedrichshafen Ag, Hitachi Ltd., Preco Electronics, Mobileye, and WABCO. Market players have been profiled in terms of attributes such as company overview, financial overview, business strategies, recent developments, and SWOT analysis.. The report provides the estimated market size of lane keep assist system and adaptive cruise control for 2016 and forecast for the next nine years. The global market size of lane keep assist system and adaptive cruise control has been provided in terms of revenue and volume. Market numbers have been estimated based on key components, sales channel, vehicle type, and regional segments of lane keep assist system and adaptive cruise control for automotive market. Market size and forecast for each major components, sales channel, and vehicle type have been provided in terms of global and regional/country markets.